Why spend your Saturday at Bethesda Green staring at a webcast all day? “I have a fascination with learning about sustainable food production, healthy living, and nutritious and traditional cooking methods,” offered one registrant who signed up for Changing the Way We Eat 2012, a viewing party January 21 at Bethesda Green. When the topic is the state of our food system and progress toward sustainability, people with various interests come to take a seat at the table. Last year’s event drew 46,000 viewing streams from 11 countries including the 40 attendees at Bethesda Green’s viewing party. TEDxManhattan 2012, the independently organized TED talk, hosted by the Glynwood Institute has a full lineup of speakers engaged in various aspects of our sustainable food system, including public health officials, community organizers, public policy advocates, farmers, restaurateurs, business entrepreneurs, and writers. Speakers include: representatives from Johns Hopkins’ Public Health, The Humane Society, The James Beard Foundation, the Leopold Center for Sustainable Agriculture, Stone Barns Center for Food and Agriculture, and Food & Water Watch. We’ve built in morning activities to get to know who’s in the room. 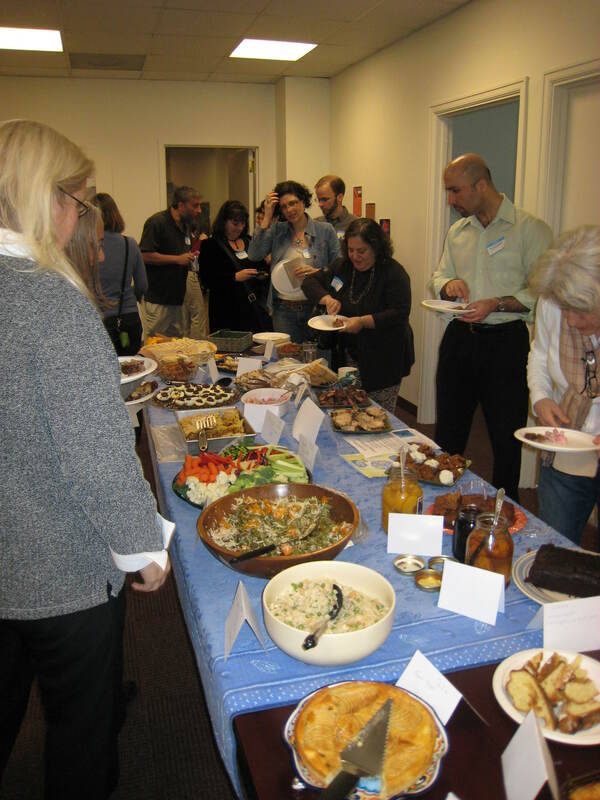 Once again we offer our Seasonal Local Pot-Luck Lunch Challenge—the challenge of course is to demonstrate that we can eat locally—even in January. Growing Legacy On Metro’s Edge — watch a film teaser from this documentary-in -progress about our local food system and the Montgomery Country Agricultural Reserve. Produced by Mark Leisher Productions and Montgomery Countryside Alliance. Introducing the new Montgomery Food Council — a group of diverse stakeholders, launching in February, will examine how well the local food system is serving its community, then find solutions to take action toward improving it. Connecting producers with buyers — check out some of the on-line and social media resources to help find and connect local food producers with buyers, both retail and wholesale. Know your food from farm to fork — How do you know where your local food actually comes from and if it is produced sustainably? Learn about seal of approval programs and how new apps bring the farm to you. Hunger in Bethesda? Bethesda Cares and partner congregations feed the homeless every day in our affluent community. Learn from those making a difference. No need to stay for the whole day–drop in as your schedule allows. TEDxManhattan’s “Changing the Way We Eat” is a one-day event in New York City that will be simulcast at viewing parties all over the world. Visit Invited Speakers to see the TEDx speakers. The full list and schedule will be published closer to the event. 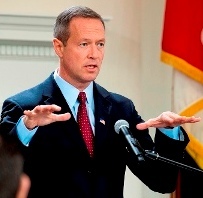 Governor Martin O’Malley announced on December 14 that the State of Maryland and the Maryland Energy Administration have reached a settlement with Exelon Corporation and Constellation Energy. The terms must be approved by the Maryland Public Service Commission by January 5 for the merger of Exelon and Constellation, the parent company of Baltimore Gas and Electric, to occur. PSC retains jurisdiction to spin off BGE in certain instances in the future, including Exelon bankruptcy, nuclear accident, or repeated violation of PSC Orders. Organic farmer Nick Maravelli agreed on Wednesday, 12/14, to drop his lawsuit against the Montgomery County Board of Education. In return, the county government gave him an extension on his lease through August 15, 2012. The lease had been scheduled to expire on December 31, 2011. That does not mean his fight is over, however. According to the Gazette, the county still plans to use the land for soccer fields. The newspaper reports Montgomery County Director of Public Information Patrick Lacefield as saying, “Since we are not going to be breaking ground before August 15, and since he dropped the lawsuit, we gave him an extension. From our standpoint, this does not change our schedule…or our intent.” Still, the Potomac Patch suggests Maravell welcomed the temporary agreement. “It gives me hope that we can continue to advance our desire to use the fields for education services,” he said. Maravell has leased from the board of education and farmed the land on Brickyard Road in Potomac since 1980. The board voted in March, 2011 to lease the land to the county for use as soccer fields. Maravell and others who want to save his organic farm have proposed that it be used as an outdoor agricultural education center for Montgomery County students. The Delmarva Farmer writes, “The Chesapeake Sustainability Institute, a tax-deductible 501c3, is already working to develop the educational center in the event,” that the county allows the Brickyard Road farm to remain in business. Bethesda Green Education, Outreach and Marketing (EOM) Group Meeting – Newcomers Welcome! Wednesday, January 11, 4:00 – 5:30 pm., 4825 Cordell Ave., corner of Woodmont Ave., Suite 200, above the Capital One Bank, Bethesda. A team of volunteers, EOM supports all of Bethesda Green’s communication efforts. From recycling to energy efficiency, sustainability to green building/design, EOM expresses the organization’s various areas of expertise in a clear and concise manner via various media. New members are welcome to join. Contact Bethesda Green Communications Director Dave Heffernan, dvheffernan@bethesdagreen.org. Help the Hungry Food Drive: Support those in need by bringing non-perishable food items to the Bethesda North Marriott. Food collection will be located near the Montgomery County Volunteer Center table. Donations will go to Manna Food Center. 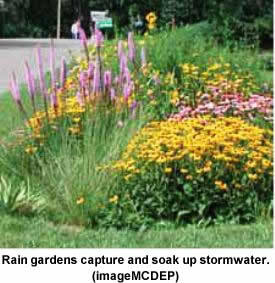 The Montgomery County Department of Environmental Protection’s rainscapes rewards rebate program offers financial incentives in the form of rebates to residential, commercial, multi-family and institutional property owners who install rainscapes techniques. Eligible projects include rain gardens, conservation landscaping, urban tree canopy, permeable pavers, pavement removal, green roofs, rain barrels, cisterns, and dry wells. Residential rebates range from $200 for installation of rain barrels to $1,200 for a rain garden, green roof retrofit, permeable pavers or pavement removal. Rebates for eligible projects may be combined until the homeowner reaches the maximum residential rebate amount of $1,200. The maximum rebate amount for commercial, multi-family, or institutional property is $5,000. Rainfall does not penetrate roads, sidewalks, driveways, parking lots or other hard, impermeable surfaces. It runs off into storm water drainage systems (sewers) and streams. Unfortunately, water runoff carries pollutants such as oil, grease, excess lawn and garden fertilizers, pesticides, pet waste, trash and debris into those streams. In some cases, the pollutants end up in supplies of drinking water. The rainscapes techniques covered by the county rebate program are meant to reduce the runoff of pollutants into our streams, protecting the waterways, wildlife and public health. The RainScapes Rewards Rebate Program is funded by the county’s Water Quality Protection Charge that appears on property tax bills. Properties within the city limits of Rockville, Gaithersburg and Takoma Park are not eligible for the county rebates. Rockville and Gaithersburg have rainscapes programs for properties within their respective jurisdictions. Annual funds for this fiscal year’s program are limited and rebates are awarded on a first-come, first-served basis. All applications must be made online and will be accepted beginning January 3, 2012. Further information and the online application form are available at the Montgomery County Department of Environmental Protection Website. Rockville-based Clean Currents announced on December 8 that the Chesapeake Bay Foundation (CBF) has committed to purchasing Green-e Energy certified wind power from Clean Currents for 100% of its facility’s electricity needs. Since its founding 40 years ago, the CBF has been dedicated solely to restoring and protecting the Chesapeake Bay and its tributary rivers by reducing pollution. 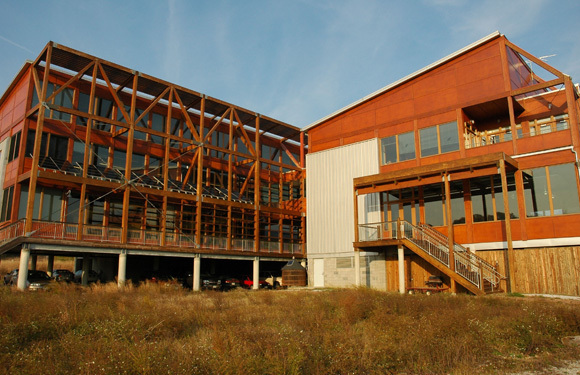 The Chesapeake Bay Foundation’s stunning headquarters (also known as The Philip Merrill Center) located in the Bay Ridge neighborhood east of downtown Annapolis, has won international acclaim as a model for energy efficiency, low impact design, and water conservation. It also has the distinction of being the first building in the United States to receive a Platinum rating through the U.S. Green Building Council’s LEED (Leadership in Energy and Environmental Design) rating program. “CBF is one of the country’s leading environmental organizations, housed in one of the country’s greenest commercial structures – so it makes sense that they also receive their electricity from a clean and renewable energy source like wind power,” said Ron Rodriguez, Vice President of Business Development for Clean Currents. The CBF’s energy purchase will avoid a total of more than six hundred thousand pounds of carbon dioxide (CO2) emissions annually – or the equivalent of removing nearly 100 cars from the roads for an entire year. We have another update for you on the Montgomery County Residential Energy Efficiency Rebate Program. Eric R. Coffman, Senior Energy Planner for the Montgomery County Department of Environmental Protection, has told Bethesda Green that his office has approved 513 projects totaling over $630,000 in rebates to county homeowners. Rebates may range between $500-$3,000. Coffman says the average so far has amounted to $1,200 per household. The county rebate program, funded by a grant from the U.S. Department of Energy, offers incentives for owners of single family properties and condominiums who install energy efficiency improvements such as insulation, Energy Star home heating and cooling systems, and Energy Star appliances. Homeowner upgrades will conserve energy. They are also good for local energy equipment sellers and installers and energy auditors. The upgrades applied for so far account for more than $3 million in economic activity within the county since September. That is more than $4 in economic activity for every $1 of program funds spent. The remaining program funding amounts to $467,000. As for rebate applications, Coffman says, “We are seeing substantial program volume,” at this time. The rebate program has a website for information and online applications. Anyone who has questions or is struggling with the application is encouraged to email help@mcenergyfunding.com for assistance. The Future of Ride-On, Tuesday, December 13, 7:30 – 8:30 pm, Silver Spring Center, 8818 Georgia Ave, Silver Spring. The Action Committee for Transit sponsors this talk by Carolyn Biggins, Chief, Montgomery County Division of Transit Services. The meeting takes place at the Woodside Conference Room in the Silver Spring Center. The Center is a 10-minute walk north from the Silver Spring Metro Station. Ride On #5 stops two blocks west of the Center at Spring and 1st. Metrobus “Q” and “Y” routes stop in front of the Center. If coming by car, enter the parking lot from Ballard Street. More information on the ACT website. BG101, Wednesday, December 28, 4:00 – 5:30 pm, at Bethesda Green. Join us for an orientation about Bethesda Green, our history, upcoming events and volunteer opportunities. First Thursday Happy Hour @ BlackFinn, Thursday, Jan. 5, 5-8 pm, 4901 Fairmont Avenue, Bethesda. Ring in the New Year with Bethesda Green. Join us for casual conversation and social networking. Bethesda Green Education, Outreach and Marketing (EOM) Group Meeting – Newcomers Welcome! Wednesday, January 11, 4:00 – 5:30 pm., 4825 Cordell Ave., above the Capital One Bank in Bethesda.A team of volunteers, EOM supports all of Bethesda Green’s communication efforts. From recycling to energy efficiency, sustainability to green building/design, EOM expresses the organization’s various areas of expertise in a clear and concise manner via various media. New members are welcome to join. More information here, or contact Bethesda Green Communications Director Dave Heffernan, dvheffernan@bethesdagreen.org. The Bethesda Green Business Incubator developed and matured in 2011 as a place for young green companies to grow. Some of our initial companies graduated, while new companies were added; our physical space grew; and services to our companies greatly expanded. Today, we have 10 companies and two nonprofits, with several more waiting to join. Four companies graduated this year: SeeEco, Glen Eco Vapor Systems, Energy Light + Control, and Bkind Vending. Three of the four were purchased by larger companies and their products and services continue to be sold. At the end of 2010, with the generosity of Capital One Bank, the incubator expanded its offices to include an additional 1,000 square feet of space to accommodate full-time resident companies. We are delighted to have filled that space this year with two existing companies and two new ones—Savenia Labs, Mark Leisher Productions, Rock Creek Conservancy and Geostellar. Most importantly, we have expanded the services provided to our companies, increasing their access to business and technical expertise. We are particularly proud to have launched a partnership with the University of Maryland for access to their wealth of business and technical resources. These resources have included the Dingman Center for Entrepreneurship in the Smith School of Business; Maryland Technology Enterprise Institute (MTech) and the Center for Advanced Life Cycle Engineering (CALCE) in the Clark School of Engineering; and the Maryland Intellectual Property Legal Resource Center in the Law School. In addition, the staff of the Small Business Development Center’s Capital Region office has worked closely with our incubator companies to provide counseling services. Our incubator continues to work closely with Montgomery County’s Department of Economic Development, particularly with its Business Innovation Network where we share expertise and education and training programs. The incubator has offered a robust lunchtime speaker series that has featured distinguished entrepreneurs and business services providers. Our distinguished entrepreneurs included Seth Goldman, Honest Tea; Scott Nash, MOM’s Organic Market; Devin Schain, Campus Direct; Lawrence Winkler, Consolidated Green Services; Charles Segerman, Clean Currents; and Tony Clifford, Standard Solar. Our business services providers spoke on a variety of topics including social media, company branding, angel investment, legislative issues in the Maryland legislature and deal structure for investments. Our coming year promises to be an even better one: more great companies and even better services. Watch us grow! Yamas’ Special Brunch Menu: It’s Greek to Me! Tony Alexis, owner of Yamas Mediterranean Grill is preparing a special brunch menu in honor of Crete: Roots of Mediterranean Diet, a presentation by chef author Nikki Rose. These two events are co-hosted by Bethesda Green, Full Plate Ventures and Yamas. Tony’s menu celebrates the flavors of his and Nikki’s home country and treats us to some unusual fare. As I reviewed his menu, I had to look up what some of these unusual ingredients and dishes are for this American palate. I hope this primer will entice you to join us for these two educational food events on December 11, from 12:30-3:30pm. Mezés (μεζές) a collective name for a variety of small dishes served as an appetizer. Dips are served with bread loaf or pita bread. EVOO The most characteristic and ancient element of Greek cuisine is olive oil, which is frequently used in most dishes. 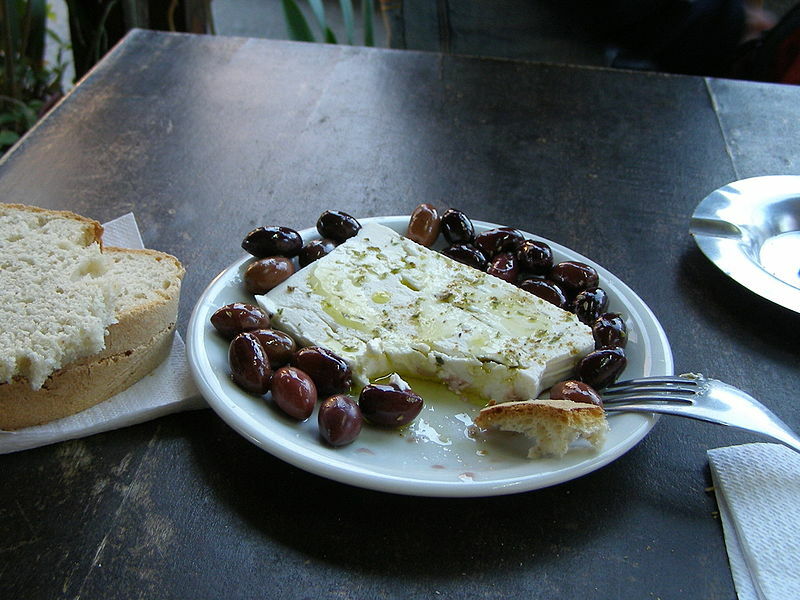 It is produced from the olive trees prominent throughout the region, and adds to the distinctive taste of Greek food. Tony uses Extra Virgin Olive Oil (EVOO) imported from Greece. Tzatziki, τζατζίκι is a Greek sauce for souvlaki and gyros and in meze. Tzatziki is made of strained yoghurt (usually from sheep or goat milk) mixed with cucumbers, garlic, salt, usually olive oil, pepper, sometimes lemon juice, and parsley—served cold. Souvlaki, Σουβλάκι, is a popular Greek fast food consisting of small pieces of meat and sometimes vegetables grilled on a skewer. It may be served on the skewer for eating out of hand, in a pita sandwich with garnishes and sauces, or on a dinner plate, often with fried potatoes. The meat is traditionally lamb in Greece. Kefalotyri Cheese κεφαλοτύρι is a hard, salty yellow cheese made from sheep milk and/or goat’s milk in Greece and Cyprus. In taste it vaguely resembles Gruyere, except it is harder and quite saltier. A very hard cheese, kefalotyri can be consumed as is. This is a popular and well-known cheese, establishing its roots in Greece during the Byzantine era. Young cheeses take two to three months to ripen. An aged kefalotyri, a year old or more, is drier with a stronger flavour, and may be eaten as a meze with ouzo, or grated on food. 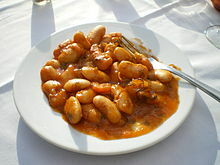 Gigantes γίγαντες πλακί, is a Greek dish known in English as giant baked beans cooked in a tomato-based sauce. Loukániko λουκάνικο is the common Greek word for pork sausage, but in English it refers to the specifically Greek sausages flavored with orange peel, fennel seed, and various other dried herbs and seeds, and sometimes smoked over aromatic woods. Greek sausages are also often flavored with greens, especially leeks. Galaktoboureko (γαλακτομπούρεκο) is a Greek dessert of semolina-based custard (sometimes flavored with lemon or orange) in phyllo. It may be made in a pan, with phyllo layered on top and underneath, or rolled into individual servings and served or coated with a clear, sweet syrup. Author Chef Nikki Rose will share her Greek heritage and take us on a culinary tour of her home and share her new book, “Crete: The Roots of Mediterranean Diet”. Join us on December 11 with a free presentation at Bethesda Green, followed by special brunch at Yamas Mediterranean Grill. To register for Nikki Rose presentation, Yamas Brunch, or to purchase Crete: The Roots of the Mediterranean Diet book on Yamas website, click the green “start ordering” button; click “Delivery”, then select the events you’ll attend. If you only wish to attend the free book presentation, please send me an email: Cheryl@fullplateventures.com. Online Registration is open 11am-9pm. Register Here. Greg Billing of the Washington Area Bicyclist Association reports on the WABA Website that Montgomery County Department of Transportation is preparing to apply for a Maryland DOT grant that would help fund 50 bike share stations and 400 bicycles for the urban down-county areas. He says county planning and transportation officials presented proposed station plans at a public meeting on November 29 at the County Executive offices in Rockville. The bike share program is dependent on the state grants which, if awarded, will be paid through Congestion Mitigation and Air Quality (CMAQ) funds, and require 20% in county matching funds. Greg says if you missed the meeting, you can submit your ideas for bike share locations on the Capital Bikeshare Crowdsourcing Map. In a closely related story, Kytja Weir reports in the Washington Examiner that the Chevy Chase Land Company has offered to pay for two bike share stations at a cost of $56,000 apiece. One of the proposed locations would be on Wisconsin Circle at the Friendship Heights Metro station. The other is at the Newlands Building near the Bethesda Metro. According to the article, the Chevy Chase Land Company is the first developer to offer financing for any portion of the county’s bike share program. Beginning January 1, a new law requires Montgomery County retailers to charge 5 cents for each paper or plastic bag provided to a customer. The County is looking for volunteers at this time to bring small signs to store managers for display in their stores. The signs would remind customers to bring their own bags when shopping. The volunteers would also distribute flyers with talking points for cashiers, to help them answer customer questions about the new law. If you are interested in volunteering, call Ansu John at the Montgomery County Dept. of Environmental Protection at 240-777-7786. That’s what the Maryland Clean Energy Center urges you to do. What’s more, they explain how to do it and the reasons why on their Power to Choose Website. The site includes 10 things you need to know before shopping for an electricity provider, a list of providers in Maryland, a step-by-step guide to choosing and switching providers, and other useful information. Ohio-based FirstEnergy Corp. announced on December 1 that its FirstEnergy Solutions subsidiary signed a 20-year agreement to purchase the output from the Maryland Solar Farm planned for Hagerstown. In addition, FirstEnergy Solutions will obtain the Renewable Energy Credits produced by the facility. The agreement demonstrates that Maryland Solar will have a guaranteed source of revenue, critical to the project’s ability to obtain financing. “FirstEnergy Solutions is proud to play a key role in the development of renewable energy across the country with more than 500 megawatts of wind and solar power under long-term contracts,” said Donald R. Schneider, president of FirstEnergy Solutions. Construction of the $70-million, 20-megawatt Maryland Solar Farm project by Maryland Solar LLC, to be located on 250 acres of state-owned correctional facility land near Hagerstown, is expected to begin by the end of the year, with completion scheduled for the fourth quarter of 2012. The project is anticipated to be operational in 2013. The solar facility will be the largest in Maryland and among the largest on the East Coast. Maryland-Asia Environmental Partnership (MD-AEP), 3rd Annual Energy and Environmental Leadership Series Banquet, Tuesday, December 6, 6:00-9:00 pm. Institute of Marine and Environmental Technology (home of the world’s first sustainable aquaculture system), The Columbus Center, Baltimore. Philippines Ambassador to the United States, The Honorable Jose L. Cuisia will keynote the event. Also expected to attend are MD Secretary of the Environment Bob Summers, Secretary John Griffin of DNR, Chesapeake Bay Commission Director Ann Swanson and key Environmental Committee members of the MD General Assembly. Tickets are $90. When registering, type “BethesdaGreen” when prompted for a discount code and receive a $15 discount. More information and registration. Bethesda Green Education, Outreach and Marketing (EOM) Group Meeting – Newcomers Welcome! Wednesday, December 7, 4:00 – 5:30 pm.,4825 Cordell Ave., corner of Woodmont Ave., Suite 200, above the Chevy Chase Bank, Bethesda. A team of volunteers, EOM supports all of Bethesda Green’s communication efforts. From recycling to energy efficiency, sustainability to green building/design, EOM expresses the organization’s various areas of expertise in a clear and concise manner via various media. New members are welcome to join. More information here, or contact Bethesda Green Communications Director Dave Heffernan, dvheffernan@bethesdagreen.org. Crete: The Roots of the Mediterranean Diet, Presentation & Brunch, Sunday, December 11, 2011, 12:30 – 3:30 pm. Enjoy the benefits of one of the world’s healthiest cuisines. Free presentation by Chef-Author Nikki Rose at Bethesda Green, 4825 Cordell Ave. Suite 200, Bethesda (12:30 – 1:30pm). Followed by Brunch at Yamas Mediterranean Grill, 4806 Rugby Ave., Bethesda (1:30 – 3:30 pm). Brunch is $30 and includes a complimentary glass of wine. More information and reservations here.